Who’s leading the weapons race in the NFL this season? Earlier this year we heard a lot about the Green Bay Packers going 44 games without a 100-yard rusher. In their second game of this season, James Starks rushed for 132 yards to break that streak. But the Packers weren’t done… in the following week Johnathan Franklin gained 103 yards on the ground for the Packers’ second 100-yard rusher of the season. But… there was more. A couple of weeks later, Eddie Lacy ran for 120 yards against the Ravens. From no 100-yard rushers in over two years to three different players rushing for 100-plus yards in a game in a matter of one month. That, however, may not be the most amazing thing about the Packers this season. In addition to three different runners gaining 100-plus yards in a game, they also have had four different receivers amass 100 or more yards receiving in a game through the first six weeks of the season. 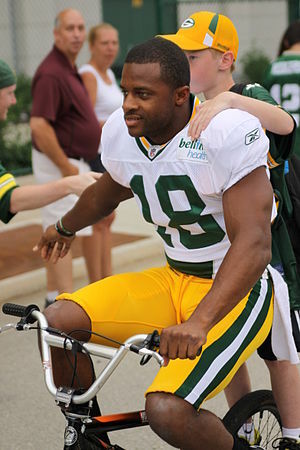 Jordy Nelson, Randall Cobb and James Jones each had 100-yard games prior to last week’s contest against the Browns. In last Sunday’s contest against Cleveland, another receiver, Jarrett Boykin had eight receptions for 103 yards, giving the Pack four different players who have had 100 or more yards receiving in a game this season. Those seven different 100-yard players are the most of any team this year in the NFL. The San Diego Chargers and New England Patriots each have had five players with 100-yard rushing or receiving games this season (both teams have had one rusher and four receivers with 100-yard games). Following are the number of different players for each team who have had either a 100-yard rushing or receiving game this year. * The Packers have the most 100-yard runners with three and are tied with New England and San Diego for most 100-yard receivers. * Seattle is the only team in the NFL this year that has not had a 100-yard receiver in a game. * This is the first season since 1980 that the Packers have had seven players with 100-yard rushing or receiving games. In 1980 they had two 100-yard rushers and five 100-yard receivers. It is the first time since 2006 that three players had 100-plus yards rushing in a game in a season for the Pack.